COLOR(S):White coat with dark red or brown spots. 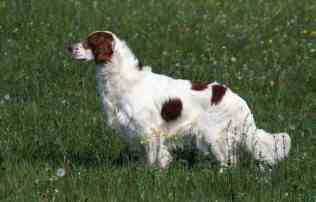 Well-proportioned and athletic, Irish Red and White Setters are powerful and good-natured. They are more heavily built than the Irish Setter, with more sturdiness, as well as likeliness to injure themselves. Aristocratic, keen and intelligent, the Irish Red and White Setter has fairly recently grown in numbers. They are strong, powerful, well-balanced and proportioned without lumber. They have a square, tapering muzzle and strong hind and forelegs. They have a tail that has feathering, though they feather less than their cousin the Irish Setter. They display a kindly, friendly attitude, behind which is discernible determination, courage and a high spirit. The Irish Red and White Setter may first appear aloof, but warms to companionship quickly. Irish Red and White Setters are more wary of strangers than the Red Setter, but still hold onto the lively, active spirit of the Setters. They are practical gundogs, and are a "thinking dog." Owners have said of the Irish Red and White Setter: "They are \'thinking dogs\' and consider you well before deciding you are worthy of their friendship." Having an exciting zest for life, the Irish Red and White Setter makes a perfectly reliable family pet. Irish Red and White Setters are active, affectionate and fun. They are playful and excited around their family, giving them a spirit of happiness. They are cheerful dogs, eager to do things. They are affectionate, outgoing and lively. They are intelligent, trainable and get along well with children and other dogs. Some may be mischievous if not trained. Irish Red and White Setters are low-maintenance, need regular brushing, and nail and ear care. Regular grooming as a pup is a useful tool in the bonding experience, leading to trust when training begins. As the breed has not been "over bred" but selectively and carefully bred by educated, dedicated people, health problems are presently at a minimum. Irish Red and White Setters are nevertheless screened for the usual genetic faults, and currently, due to responsible breeding practices, we enjoy few, if any, congenital problems. One health concern for this breed is cataracts. Irish Red and White Setters benefit from regular exercise but adjust well to any living situation, provided they are regularly mentally challenged. They also need free space. The best owner for this breed would be a dog-experienced, active owner living in a country setting. Irish Red and White Setters are very malleable, quick on the uptake. They are high in intelligence and are very trainable, but do require more time to learn. They are slower at training than the other Setters. Learning Rate: High, but slow. Obedience - Medium. Problem Solving - High.